Boeing has finally unveiled the potential successor to the legendary Blackbird SR-71 spy plane (pictured)- and it is set to travel at more than five times the speed of sound. "Boeing has finally unveiled a concept for the potential successor to the legendary Blackbird SR-71 spy plane - and it is set to travel at more than five times the speed of sound. This 'Son of Blackbird' could become a high-speed strike and reconnaissance aircraft in warfare of the future, travelling at such speeds that adversaries would have no time to react or hide. The SR-71 Blackbird is one of the most spectacular aircraft ever built. It is a long-range, supersonic reconnaissance aircraft capable of flying at Mach 3.2. When it first flew, it was an amazing performer and still is after three decades of unmatched capabilities. 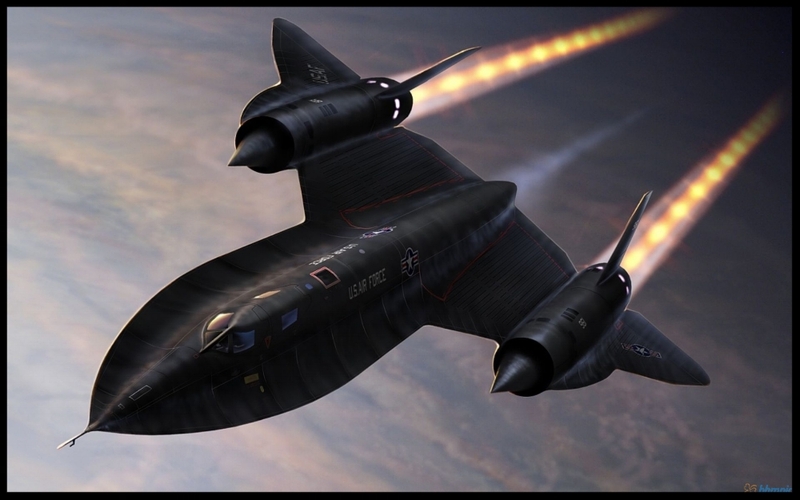 “Two Pratt & Whitney J58 axial-flow turbojets with afterburners, each producing 32,500 lb of thrust, powered the Blackbirds. Less than 20 percent of the total thrust used to fly at Mach 3 was produced by the engine itself, however. During high-speed cruise conditions the balance of total thrust was produced by the unique design of the engine inlet and a moveable conical spike at the front of each engine nacelle. Under these conditions, air entering the inlets bypassed the engines, going directly to the afterburners and ejector nozzles, thus acting as ramjets. The aircraft was 107.4 feet (32.73 meters) long, had a wingspan of 55.6 feet (16.94 meters), and stood 18.5 feet (5.63 meters) high (from the ground to the top of the rudders when parked). Gross takeoff weight was about 140,000 lb (52,253.83 kilograms), including a fuel weight of 80,000 lb (29,859.33 kilograms). Aerodynamic control surfaces consisted of all-moving vertical tail fins above each engine nacelle and elevons on the outer wings and trailing edges between the engine exhaust nozzles. “On it’s last flight ever, the SR-71 Blackbird set a speed record. It flew from Los Angeles to Washington, D.C. in 1 hour, 4 minutes, and 20 seconds. It averaged 2,124 miles per hour on this flight. Once it landed in D.C. it went straight into the Smithsonian. The SR-71 served as an unparalleled force multiplier with its advanced sensors and mission critical reconnaissance. Even with its short operational life span the SR-71 set the stage for the development of supersonic and hypersonic technology”. “Building the future at Boeing requires looking decades ahead at what could be possible, and innovating now to make it happen. That’s the impetus behind Boeing’s first passenger-carrying hypersonic concept that was debuted at the American Institute of Aeronautics and Astronautics conference in Atlanta this week. The passenger concept could have military or commercial applications; this is just one of several hypersonic vehicle concepts spanning a wide range of potential applications company engineers are studying. Engineers are working companywide to develop enabling technology will position the company for the time when customers and markets are ready to reap the benefits of hypersonic flight. Guinness World Records recognized NASA's X-43A scramjet with a new world speed record for a jet-powered aircraft - Mach 9.6, or nearly 7,000 mph. The X-43A set the new mark and broke its own world record on its third and final flight on Nov. 16, 2004. “The X-43 was an experimental unmanned hypersonic aircraft with multiple planned scale variations meant to test various aspects of hypersonic flight. It was part of the X-plane series and specifically of NASA's Hyper-X program. It set several airspeed records for jet aircraft. The X-43 is the fastest aircraft on record at approximately Mach 9.6. A winged booster rocket with the X-43 placed on top, called a "stack", was drop launched from a Boeing B-52 Stratofortress. After the booster rocket (a modified first stage of the Pegasus rocket) brought the stack to the target speed and altitude, it was discarded, and the X-43 flew free using its own engine, a scramjet. It uses a Rotary Ramjet engine as the air-breathing engine and then converts to a rocket to reach a suborbital altitude. A line of counterflowing jets of air on the aircraft’s leading edges reduces heat and drag during the ascent and re-entry phases of the flight. The Paradoxal would to take off directly from any airfield using two Rim-Rotor Rotary Ramjet Engines (R4E). These turbines produce significant thrust in a single-stage by spinning ramjet thrusters at supersonic speeds (tip speeds up to Mach 3) held together by a carbon-fiber rim-rotor. The R4E engines have a high power-to-weight ratio and could be manufactured at relatively low production costs (similar to today’s automotive turbochargers). Efficiencies are similar to piston engines and low pressure ratio gas turbines (20-30%). In mid-flight, you would see earth’s curvature and the plane’s multiple onboard cameras would grant you access to video feed of the view along with the best pictures. You would even get to experience weightlessness for one brief minute before heading back towards earth. The leading edge of the plane’s wings would be fitted with linear ‘Long Penetration Mode (LPM) nozzles’ so that air could flow out of them to create a ‘paradoxal’ effect whereby the plane could fly faster. As the speed increased to first supersonic, then hypersonic velocities, the engines or onboard tanks of compressed air would supply air to the LPM nozzles along the leading edges of the plane. As the Parodoxal accelerates and climbs, the LPM effect would reduce thermal loads while also reducing overall drag. For this reason, the Parodoxal has a flying wing or blended wing body shape with one long leading edge. Passengers sit in one large, theatre-like cabin. Galleys, heads, and baggage stowage compartments are aft. Gone are the days of tube-and-wing planes with their long rows of cramped seats. For the cruise part of the trajectory, the passenger plane would fly well above the stratosphere, at the very edge of black space. Hundreds of passengers would enjoy spectacular views of our planet. (A Large panoramic rooftop would definitely be a plus if it can be designed to endure the heat and stress). About 45 minutes before landing, the LPM flow would be restarted using air from compressed air tanks. The LPM effect will cool the plane during atmospheric re-entry and allow it to slow gradually to subsonic velocity. By the time it returns to 50,000 feet in altitude, Parodoxal will again use air-breathing turbine engines and flying below Mach 1 for its final approach to its destination.